By the time the coastal route to Gympie was first opened up in 1868, the main road from Brisbane followed today’s Gympie Road to Lawnton via Bald Hills and Strathpine, bypassing the Old North Road to the west which had been the first road to traverse the Pine Rivers District. Instead of crossing the North Pine River in the vicinity of today’s road bridge, Gympie Road originally followed the alignment of Leis Parade to connect with Petrie’s Crossing and passed through Sweeney Reserve to emerge near the present-day intersection of River Street and Old Dayboro Road. 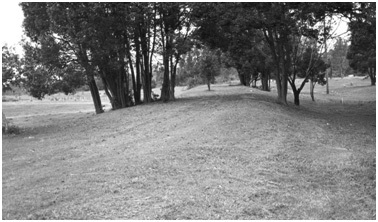 A raised embankment in the reserve, fringed by Camphor Laurel trees, still marks the route formerly taken by this road. At high tide and following periods of heavy rain, however, Petrie’s Crossing was impassable. It has been recorded that Carl Leis (1839-1926), who purchased land on the southern bank of the river adjacent to the reserve, operated a barge service over the North Pine River to ferry horses, carts and passengers. Raised section of former main road, Sweeney Reserve, 1976.